Louisiana’s “hog dog” is a jambalaya of native American dogs, Spanish Mastiffs, and Greyhounds. Catahoulas were created to track and drive feral hogs and cattle when it was time to butcher them, and not surprisingly they are aggressively resolute in their work. The Catahoula is a unique dog with a fascinating heritage and strong working ability. It is not suited for life with every family, but when you make a commitment to one and form a bond with him, you have a steadfast protector and companion for life. 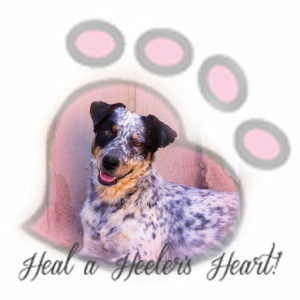 This tough yet strikingly beautiful dog can have a spotted, brindle, solid, or patched coat of many colors. Other outstanding physical characteristics are his webbed feet, which allow him to swim well and work in soft, marshy areas, and his eyes, which may be blue, green, brown, or amber. 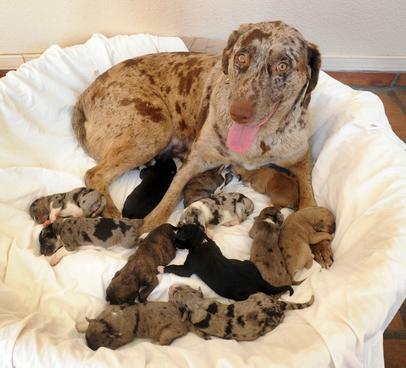 Some Catahoulas have eyes that are each a different color or “cracked” eyes: two different colors within the same eye. Befitting their heritage as herding and driving dogs, Catahoulas are wary of strangers. They’re protective of their families and opinionated about who is and isn’t trustworthy. People who live with them say they’re excellent judges of character. Expect to provide this hard-working and independent dog with strenuous exercise daily as well as firm guidance during training. When their exercise and leadership needs are met, Catahoulas are loving, calm, and dedicated companions. Not recommended for a timid or first-time owner. This breed needs a confident trainer who is consistent and firm but also loving. A dedicated companion dog and does poorly in isolation and should live inside the home, not outside.